This is a shot looking up at the roof of the CKCO-TV transmitter building you see in the previous picture, taken in the same direction standing on the hill. Obviously we do not own the two big towers but have two Sinclair 210-series antennas on the smaller tower, one near the middle and one near the top. The weather instrument package is obvious just to the right of centre - this is the Uni-mount system sold by Peet Brothers (highly recommended). On the left end of the cross-beam is the temperature and humidity sensor in a solar radiation shield (makes the temperature read accurately, despite being in full sun). On the right end of the cross-beam is the rain guage which has no moving parts and reads in .01 inch increments. 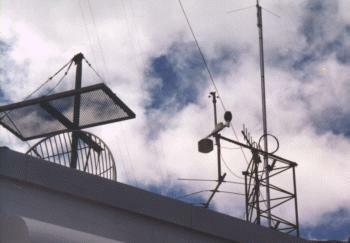 On top of the vertical element are the anemometer and the wind vane. In the centre (just to the right of where the arms cross) is the junction box and the 8-wire data cable runs 90 feet to the KWARC radio building. The mast just to the right of the weather instrument assembly supports an 18 foot dual-band (144/440MHz) antenna which the VE3KSR APRS digipeater shares with a UHF link radio to a 6 meter voice repeater on 53.370 MHz. The ground plane is just at the top of the picture and the antenna extends above that. We will shortly be multicoupling the digipeater into one of our antennas on the smaller tower which will further improve the already respectable HAAT (height-above-average-terrain). To the left is a microwave link dish antenna for the Region of Waterloo trunking system. The sturdy steel platform mounted above it is to prevent it from being crushed by sheets of ice falling from the two main towers (believe me - you do not want to be anywhere near when chunks of ice fall 600 feet from a tower!). Being (poor) amateur radio folks, we can't afford such luxuries instead relying on the hope-and-pray system.